Life was a preparation for death, and when you reached your stopping point you were surrounded by spells, incantations, your servants and family. You would be buried under rushes and dehydrated for 70 days, your organs carefully transplanted into alabaster jars, your brain, which had no value, was pulled out your nose. After your body was embalmed and wrapped in linen, your spirit and body would meet Osiris and 40 other deities in a ceremony called the “Negative Confession”. You’d deny any wrong doings in your life and have your heart weighed by the scales of justice, a baboon regarding you through squinted eyes. Once you were considered “true of voice”, all would be confirmed in writing by Thoth, the royal scribe and you’d make your way to your blissful eternal home in the Netherworld. Read more here: Egyptian Book of the Dead. I’m working on a slexhibition about a real life Victorian who recorded her travels to Egypt in 1875. 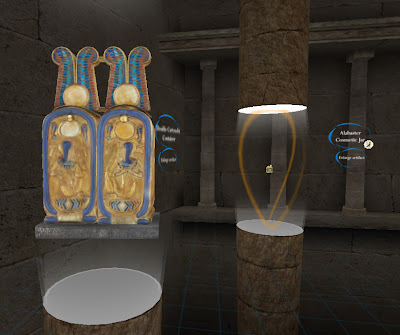 I’ve never been there, never smelled the dry air or seen scattered mummy parts in the sand...Instead I visited King Tut Virtual, organized by Rezzable. Wow! This exhibition is clearly put together by experts in design and museology. It’s one of the most layered, content rich exhibitions I’ve been to; informative without being overwhelming, chock full of detail but no lag. In front of the orientation station/teleport hub lies the Valley of the Kings...the Eye of Horus symbol transports you to archaeologist Howard Carter’s camp and finally down into the dark recesses of the tomb of Tutankhamen . Audio clips describe everything around you in wonderful detail, including a radio clip of Carter describing his discovery. My favorite technological trick was being able to enlarge artifacts from their original size. After learning so much, I skipped through the sand in my sandals, boarded an ancient barque (boat), threw water on the local hippos and, like all museum visits, there are shops to buy trinkets. This is truly a must-see exhibition. 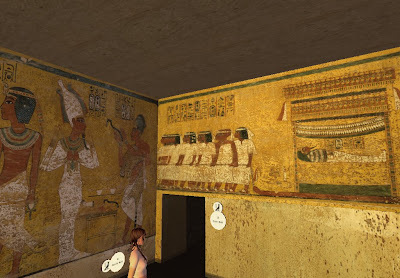 King Tut Virtual, Kings Rezzable (17, 85, 2336).